Finally recovered from working too (long) days at the Miami International Book Fair. Saturday I started at 6 a.m and worked until 7 pm. Sunday wasn't as long but by the end of the day I was dragging. I met so many authors and took many photos including photos of Al Gore, Ralph Nader, Edna Buchanan, Gerald Posner, Roy Blount Jr., Leonard Pitts and John Hodgman (the PC guy on the Apple computer commercials). It was a great weekend and it was very inspiring. I'm going to do all I can to make sure my book SOUTH BEACH STAR is published soon so I can be at next year Fair as an author. Today I'm working on research for the Miami website, finishing my feature on Art Deco for Where Magazine and writing another chapter (for my ghost writing client). I'm still exhausted but not too tired to go to the gym for my ABs class. Hopefully it will energize me as I have to come back and finish writing. 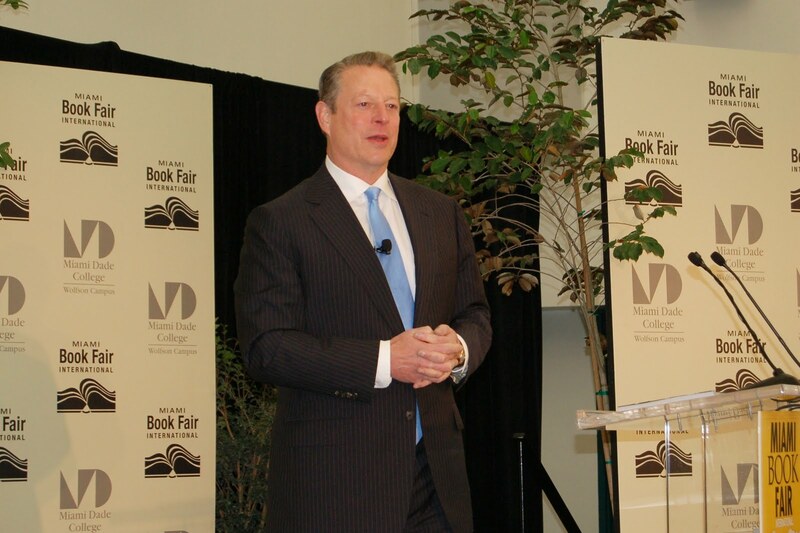 PHOTO: Al Gore.